Join Our #DisneyKmart Twitter Party!! Follow the host @Kmart account and co-host @ShopYourWay accounts. Retweet one of the promotional tweets announcing the party. These normally contain “RT to RSVP” in them. Participate in the conversation when it occurs Friday November 16th at 12pm CT, by answering questions and chatting to others under the #DisneyKmart. Make sure you use #DisneyKmart, or we won’t be able to see your replies! The winners will be selected as the party goes on, but if any of the above criteria are missing you will be unable to claim your prize. If you are announced a winner, simply reply that you accept the prize and a Sears Holding rep will be in contact with you via DM for the next steps. How AWESOME would it be to have your kid(s) wake up to a Disney character?Mickey, Buzz, Woody, or Cinderella can call to wake them up with a good morning greeting! 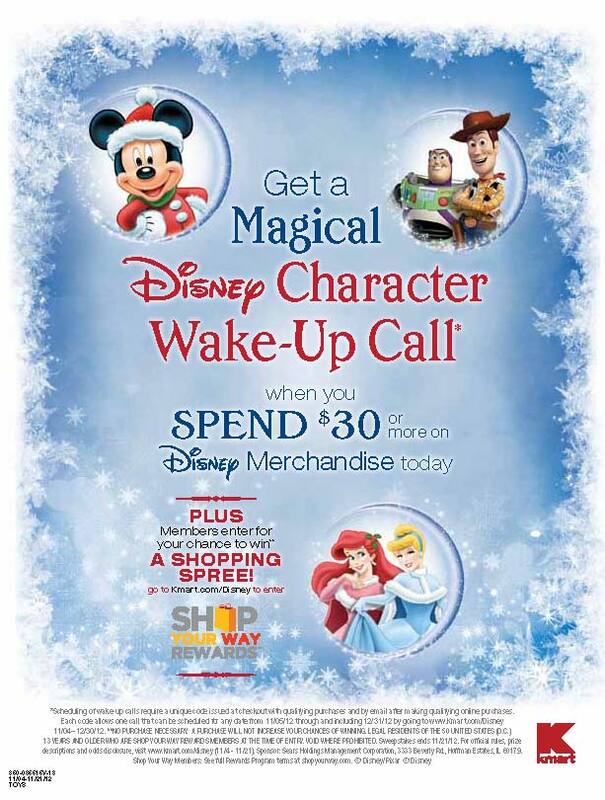 All you need to do is to purchase $30 of Disney merchandise from Kmart and then visit this link to schedule the call.